Are you sure you're getting the best deal every time you shop online? You're probably not. Amazon has everything you could ever possible want to buy, so it makes sense that it's the most popular place to shop online. But did you know that Amazon also makes it difficult to find the best deal. Even the most savvy shoppers have been known to overpay without realizing. I know I've fallen victim - you're in a hurry, no time to search for coupons, no time to compare prices. It happens. Luckily, there's an easy way to get even more from Amazon and save more money than anyone else. It's called the SwagButton and it's from Swagbucks. It's my go to browser add-on for all my online shopping. Whether I'm on Amazon, Target, Walmart, Jet or any other website, I know the SwagButton has me covered with every coupon on the web AND extra cash back (sometimes up to 10% extra). And it's free. And, yes, it works with Prime! After you install the SwagButton, go ahead and shop online the same way you always do. 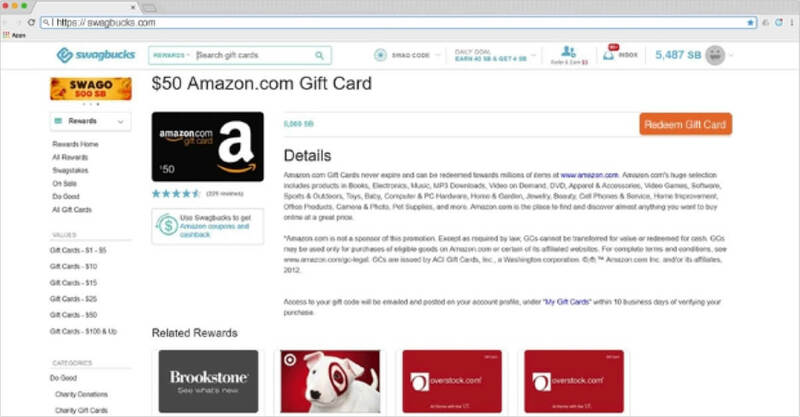 Swagbucks has already partnered with thousands of websites (almost every site you'd ever actually buy something from) and works in the background while you shop to analyze all available coupon codes for the site. Click the SwagButton icon to see all available discounts. At checkout, let the SwagButton know which coupon you want to apply and watch with glee as the price drops instantly. I saved $67.23 at Jet.com. AND there's a huge bonus I haven't even mentioned yet… CASH BACK! In addition to finding the biggest savings, Swagbucks also gives extra cash back for your purchase. Look! After making this purchase, in addition to my $23.67 savings, I received an extra 10% cash back (approximately $7). I've been saving my points for a few weeks and have now earned enough points to redeem for a FREE $50 Amazon gift card. You'll need the SwagButton if you want to take advantage of this shopping hack. It feels amazing knowing that I was able to save a bunch of money on my purchase AND get a free gift card when all was said and done. If you're like me and never feel good about an online purchase unless you're sure you got the best deal, then Swagbucks is the only tool you need. I like to make every dollar count. That's why I never shop online without Swagbucks, and why I tell all my friends to install it too. If you'd like to try out the SwagButton, click the button below. Happy shopping!